I went to both Flying Lotus shows in Los Angeles last weeked. The Friday night one was one of the loudest, bass-heavy shows I’ve ever attended. Saturday night featured Gaslamp Killer, Gonjasufi, Ravi Coltrane, and the debut performance of Flying Lotus’ incredible new band: Infinity. 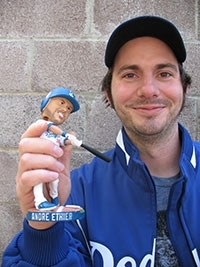 Tuesday was bobblehead night for the Triple Crown threat, Andre Ethier. The Dodgers won, stretching their winning streak to 9 games, but Mr. Ethier was not in attendance because he broke his pinkie last weekend. Hope he heals quickly. Looking forward to Everest and Minus the Bear tonight at the Mayan Theatre.